This closed case tape, protects the blade and internal workings with a hard-wearing, high impact ABS case that fits comfortably into the palm of your hand. 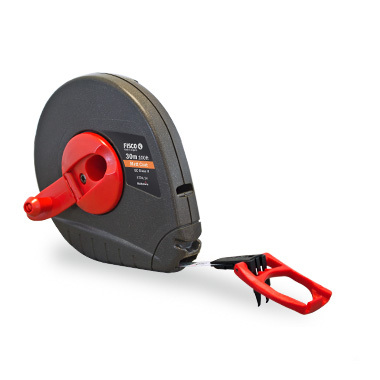 The 10mm ‘Matt Coat’ polyester coated steel blade is fitted with a unique triple action end-loop with fold-in claw enabling the tape to be anchored into or over a wide variety of objects and surfaces. Rewinding is made easy and comfortable with the sturdy winding handle and rotating winding knob, which can then be stored neatly back into the centre of the tape. 10mm ‘Matt Coat’ polyester coated steel blade, accurate to EC Class II. Impact resistant moulded ABS case, ultrasonically welded for added strength. Unique triple action end-loop with fold-in claw. ABS belt clip moulded on to the rear of case. *English blades only available in certain markets.